Why wouldn't you buy 60 dolls and remake a Nirvana video? - Denverite, the Denver site! Why wouldn’t you buy 60 dolls and remake a Nirvana video? Denver artists John Johnston and Scott Wallace remade Nirvana’s “Smells Like Teen Spirit” with a cast of dolls, and it’s really something. May. 25, 2016, 9:56 a.m. The second step to making a miniature recreation of Nirvana’s video for Smells Like Teen Spirit is to buy a miniature recreation of Kurt Cobain’s head for $25 on eBay. The first step is to follow your dreams. “I’m 44 years old,” says John Johnston, the Denver commercial artist who directed the video in collaboration with Scott Wallace at their ART HACK studio on Champa Street, a few blocks from Coors Field. Not this time. 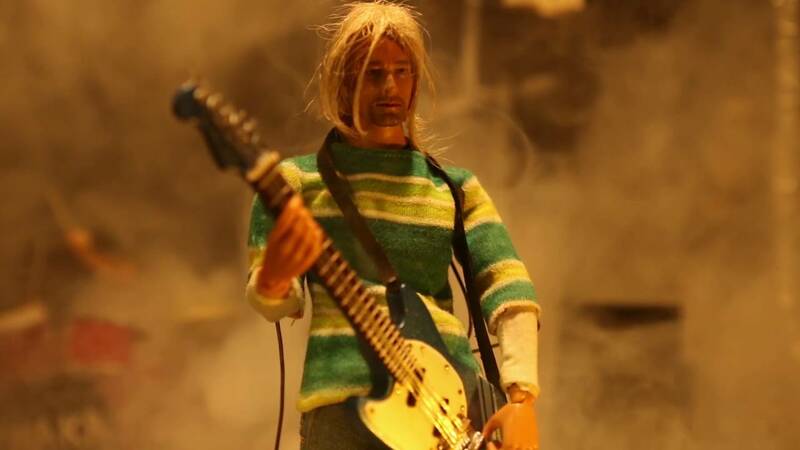 Their meticulous collaboration was featured recently on Nirvana’s official Facebook page, which has to be the ultimate victory for anything starring a tiny Kurt Cobain. Well, it’s best not to look too deeply into the abyss, what with the threat of the abyss looking back, but the Nirvana video is rooted in an earlier project: Wallace and Johnston’s doll-based version of the reality show Alaskan Bush People. “At the time, I was so intrigued by their story, and I really believed it, I thought that they were real,” Johnston says of the Alaskan bush persons. So he and Wallace started experimenting with dolls in their warehouse-style space, as a kind of artistic comment on it all, and the results were mildly popular on YouTube. This all came to a head when New Belgium’s film festival offered the artists $1,000 to make a short film. They realized that it was the 25th anniversary of Nirvana’s breakthrough album, and they remembered that they had a ton of lifeless little figures just sitting around, and then Johnston ordered the tiny Kurt Cobain head. The whole Nirvana project took close to a week of full-day shoots, plus a few days of prep and editing, and countless hours more for Wallace to build tiny guitars and a bass, including one that could be broken for maximum rock effect. They rebuilt Nirvana’s grungy high-school gymnasium on a plywood base, complete with red basketball court lines on a dark floor, and they started modifying their minions. Cobain’s head sits on a woman doll’s body, to get his skinny frame right, while bassist Krist Novoselic had to have half his skull transplanted in order to get the right hairdo. Sticks, wires and string made the band members move. The scenes with the 50-plus other dolls were a little more primitive. Johnston watched the original a few hundred times as they worked, picking up all these new details that he just had to add – a word on Grohl’s shirt, a piece of duct tape, any little thing. The whole thing is admittedly pretty janky. The dolls’ lips don’t move, and it’s not hard to see their strings – yet the video moved into a uncanny valley when its makers added lighting and a smoke machine. It’s funny, especially one when of the dolls does a backflip into the crowd, but Johnston found something deeper. All that time with Little Kurt reminded him of the real Cobain’s late genius. “I’m surprised. There was a point when we were filming that I felt really sad … I missed him after doing it, and spending that much time listening and watching the music video,” he says.